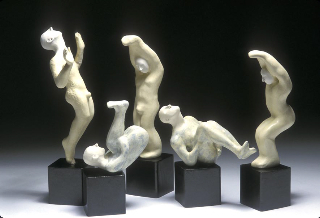 Alice Simpson, whose Artist Book, “Bird” appears on The Compleat Eadweard Muybridge website [go here and then scroll down], has kindly sent some photographs of her other Muybridge-related work, in which she references his somersaulting figures. 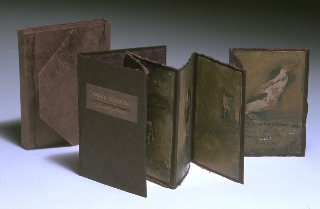 The first is another artist book, the others are ceramics. Enjoy. I recently stumbled across this certificate, illustrated in Homer Croy’s book 1918 book How Motion Pictures Are Made. Eight hundred fifty-two judges were divided into committees, which then judged divisions and departments. 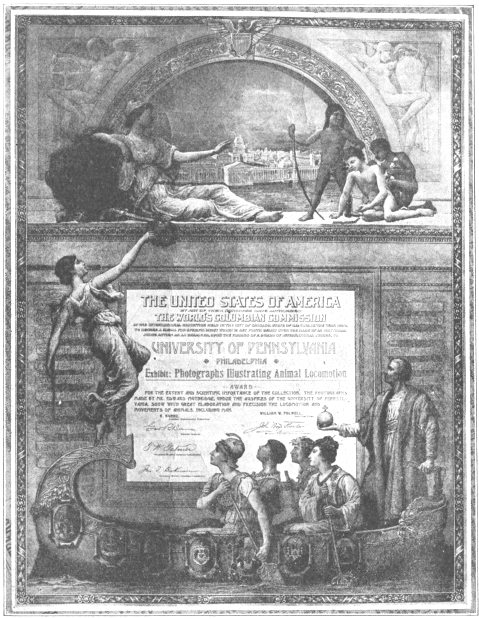 The awards highlighted “the development of the resources of the United States and the progress of the civilization in the New World, as compared with all participating nations.” Each winner received the diploma of honor (the certificate) and a bronze medal, both prepared under the direction of the United States Secretary of the Treasury and designed by William Low, who was also the designer for most of the fresco work at the Exposition. The diploma was meant as a certificate of identification and the medal as a memento of success. To avoid complaints about favoritism, all the bronze medals were alike except for the engraving of the name of the exhibitor. 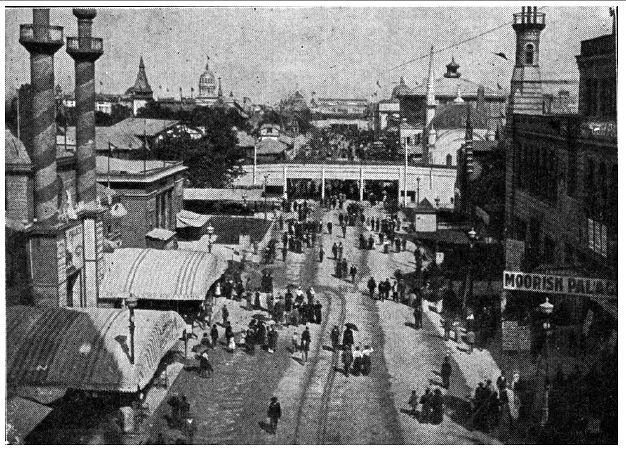 During the 179 days of the fair, Hubert H. Bancroft reports that 27,529,400 persons attended the fair, the largest attendance for a world’s fair up to that date. In additional there were 65,422 individual exhibitors. As was the custom, exhibitors at the fair were given awards; however this fair’s awards were non-competitive, “granted upon specific points of excellence or advancement formulated in words” rather than for exhibit design. At the Chicago fair, 36 percent of exhibitors won an award, or 21,000 exhibitors receiving 23,757 awards. Bancroft comments that this is far less than at previous world’s fairs: Vienna, in 1873, awarded 26,000 among 42,000 exhibitors (62 percent ), 42 percent won medals at Philadelphia in 1876, and 55 percent were honored at Paris in 1889. 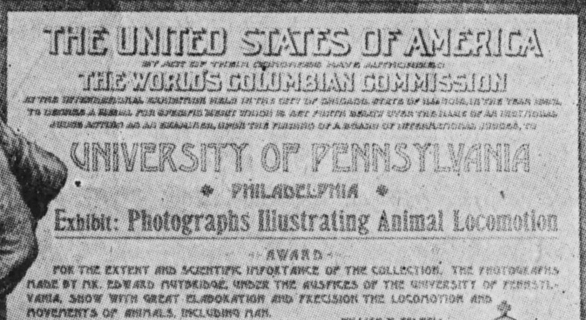 Muybridge’s biographer Robert Bartlett Haas mentions the Award, and notes that the certificate is in the [Kingston] Scrapbook, but I don’t think it is; perhaps he read about it in a cutting there. 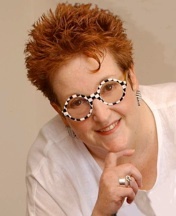 It could have been with the University when Croy – occasional screenwriter, biographer, and author of books about life in the Midwestern United States – saw it. Maybe it’s there still. From the website of the American Historical Association (the AHA also gained a prize) we learn that the Certificate was large, measuring 24.5 inches high and 19 inches wide. It shows Columbus with the “races of the world” underneath Columbia pointing the way to the White City of the fair. That dark blob on which the figure top left is leaning, is a bison. Zoopraxiscopic hall is the building of formidable name in which are given illustrated lectures on animal locomotion as applied to art. The discourses and the pictures are both entertaining and instructive, and through them one may learn surprising facts as to animals in motion and the positions which they assume. Investigation in this line is a speciality which has been pursued within comparatively recent years, among the most prominent of those who have engaged in it being Ottomar Anschuetz, of Lissa, Prussia, whose tachyscopes are exhibited in the electricity building, and Eadmund Maybridge (sic! ), who displays some of his results in the hall on the plaisance. With photographic apparatus so perfected that an exposure of one ten-thousandth part of a second is sufficient for a truthful impression, the labors of such men have been prolific as results. 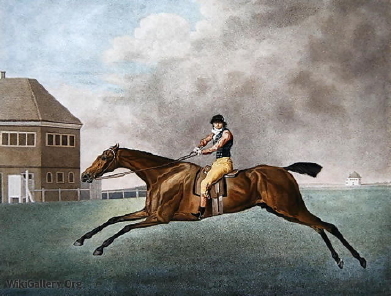 The step of a man in the act of walking has been photographed at various points of motion, as well as the jumping and galloping of a horse, the climbing of a monkey, and the flight of a bird, with its motions upon the ground. Thus long established ideas which have obtained even among the most observant artists have been corrected, these investigations being of interest and value to the scientist as well as to the world of art. 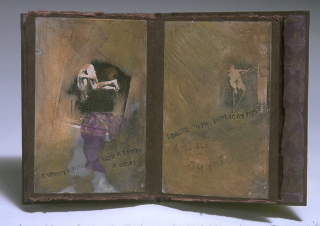 “….my research in anthrozoology (human-animal studies) draws me primarily to Muybridge’s animals, and inclines me to be suspicious of both his perspective and his motives in capturing these creatures’ animating force. If Muybridge’s contextualization of his human models reifies the prevailing notions of gender, his animal studies even more profoundly perpetuate the anthropocentric prejudice that other animals exist to serve our own higher purposes. Some American Indians believe that to take someone’s image involves actual usurpation of the living spirit. 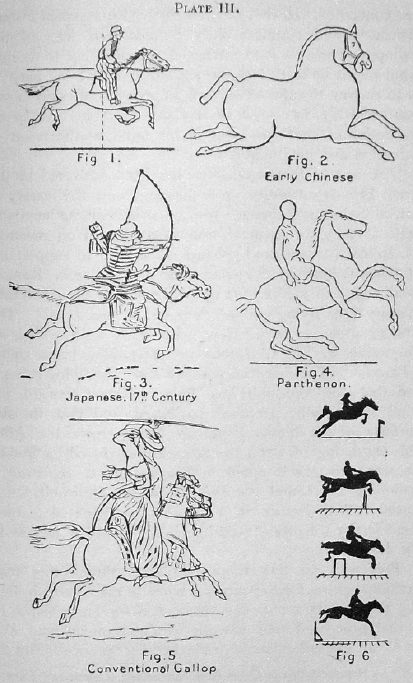 But do these images displace the actual movement of the actual horse? Have we taken motion from the animal? Having penetrated the animal’s secret, its force of speed, do we exert some kind of control over it? The animals are curiously reduced, caught in the mechanics, the physics, of photography. They are composed not of flesh and blood and hair, but of silver albumen and paper. There were so many of them in the Corcoran Gallery that I couldn’t really see them at all. I certainly couldn’t hear them, or smell them, or feel (as I do in proximity to a real horse) awesomely dwarfed by them. Broken down by Muybridge and his apparatus, they don’t do anything but run, and run. 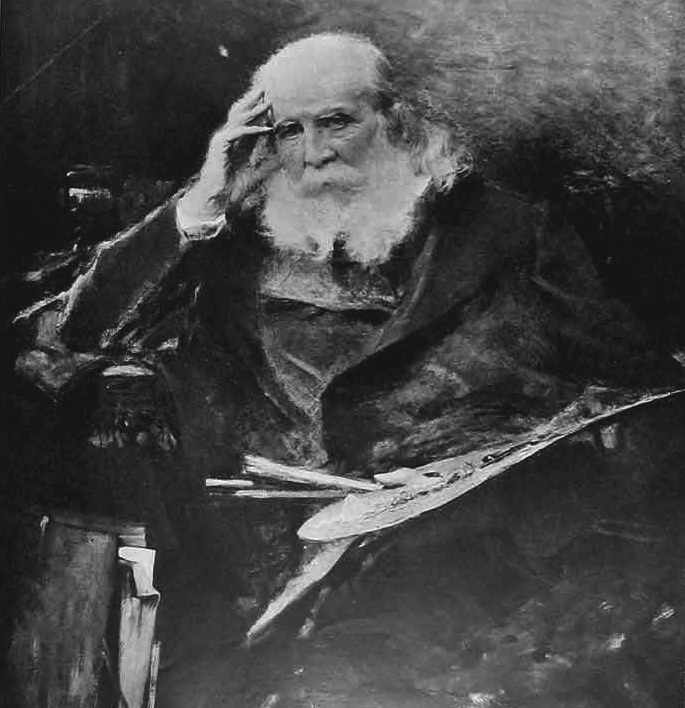 Their force and motion no longer seem their own, but Muybridge’s, and ours. Something of their wildness has been trapped, isolated, and abrogated. Although the human viewers learn much more about the horses, I believe the horses themselves lose something in this transaction. Randy Malamud is a professor of English at Georgia State University. 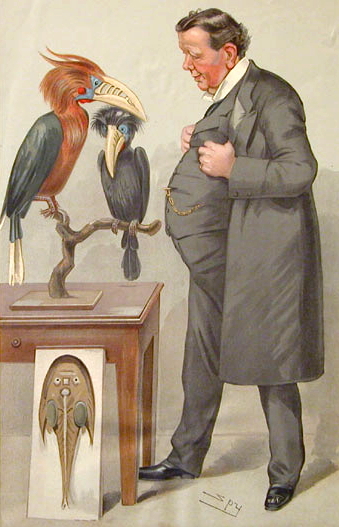 He is author of Reading Zoos: Representations of Animals and Captivity (New York University Press, 1998) and Poetic Animals and Animal Souls (Palgrave Macmillan, 2003), and editor of A Cultural History of Animals in the Modern Age (Berg, 2007). “I found the premise of this essay ridiculous and fantastical….. Mr. Malamud has taken Muybridge out of his context…. The article is well written and covers a lot of ground – worth reading, part-parody or not. “Following an NPR story on the first-ever retrospective of Eadweard Muybridge’s work at the Corcoran Gallery of Art, NPR invited the public to submit Muybridge-inspired creations. 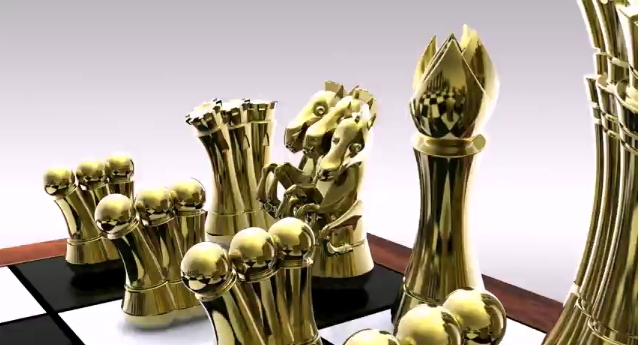 We left the guidelines open, asking only that the pieces somehow carry the father of motion pictures into 2010. We received hundreds of submissions — animations, paintings, sculptures, still photographs, dancing bananas and murder mysteries. After review by our panel of judges — Corcoran senior curator Philip Brookman, film director Mark Neale (who created U2’s Muybridge-inspired “Lemon” video), NPR multimedia editor Heather Murphy, NPR Picture Show blogger Claire O’Neill and NPR designer Callie Neylan — we have our favorites. The top three winners all take Muybridge’s iconic galloping horse in new and interesting directions. 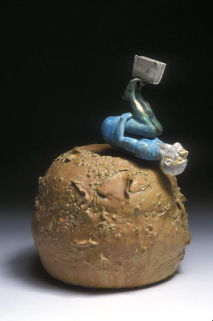 This sculpture sits in the lobby of an apartment building in San Francisco. 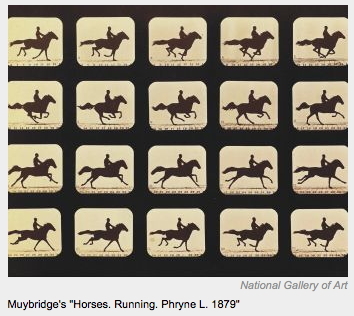 Brown created it using small mirrors with reverse cutouts of Muybridge’s iconic galloping horse. 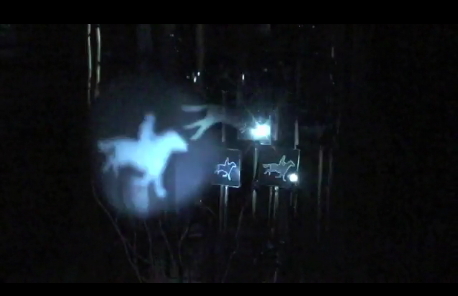 Light-emitting diodes aimed at each mirror are quickly flashed, reflecting the image of the horse onto the frosted glass face of a bell jar and thereby reanimating the horse. Fort, who calls himself the “Kinetic King,” takes the domino-effect to a new level, incorporating thousands of Popsicle sticks, piles of plastic cups, blocks swimming flippers and more in a chain reaction that goes on for nearly five minutes. 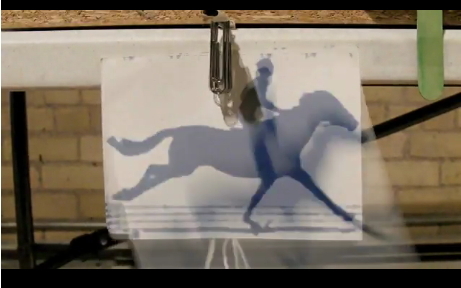 At one point a string is pulled releasing a cardboard flipbook of Muybridge’s galloping horse. Want to see more? 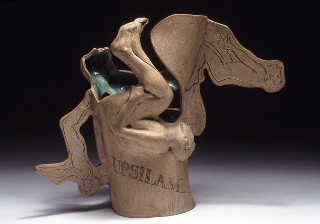 He’ll be performing his Muybridgeoscopes live at the Corcoran Gallery of Art on July 10th. (The judges did not know this when his video was selected). This stop-action animation piece, created by a Corcoran student just for the contest, offers a sweet take on Muybridge’s legendary study of horses. 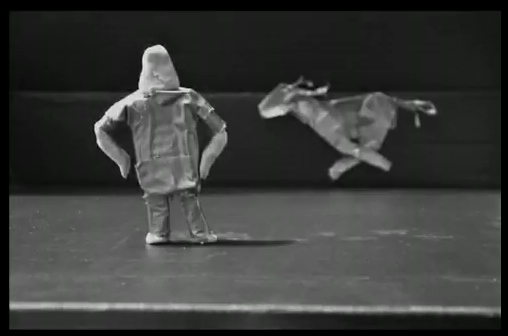 Melendez created the horse out of duct tape and the little Muybridge figure out of Play-Doh. Congratulations from Muy Blog to all the NPR-Corcoran Contest winners. Photographs were also eligible – more about these in a future post.